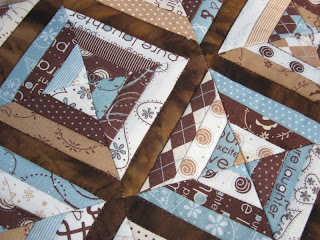 I used the "Pure" fabric range by Sweetwater for the pieced centre. 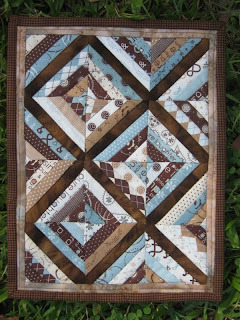 It was paper pieced in a strip piecing method, then the paper torn off and the border added before I quilted it. The backing is a lovely piece of cotton fabric in coordinating colours. I haven't put a hanging sleeve on it yet, because I love how the back looks too. The recipient can let me know if they would like me to put a sleeve on before I send it. 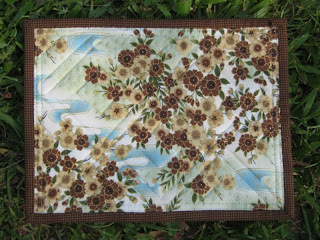 This is not an arty quilt, it is a miniature traditional quilt! The blocks are about 2 1/2 inches instead of the normal 12 inches square.